At Foakes, we source, roast and blend coffee from various regions around the world. Join us for your daily dose of caffeine whilst watching us hand-roast our beans. Why not indulge in one of our freshly made sandwiches, made from breads straight out the oven. Relax, socialise or catch up on emails whilst getting some fresh air in our beautiful courtyard. We source a variety of beans from all over the world. The key to making flavorful coffee is using freshly-roasted beans. At Foakes, we hand-roast our beans, as needed in small batches, ensuring fresh beans. Currently, we have 5 single origins and 2 unique blends. Ask to try any roast when you visit Foakes to find the flavour that you love. We bake DAILY. That means fresh, warm breads are available to you whenever you visit. Maggie, our sourdough starter has been growing for many years, producing hundreds of breads a week. 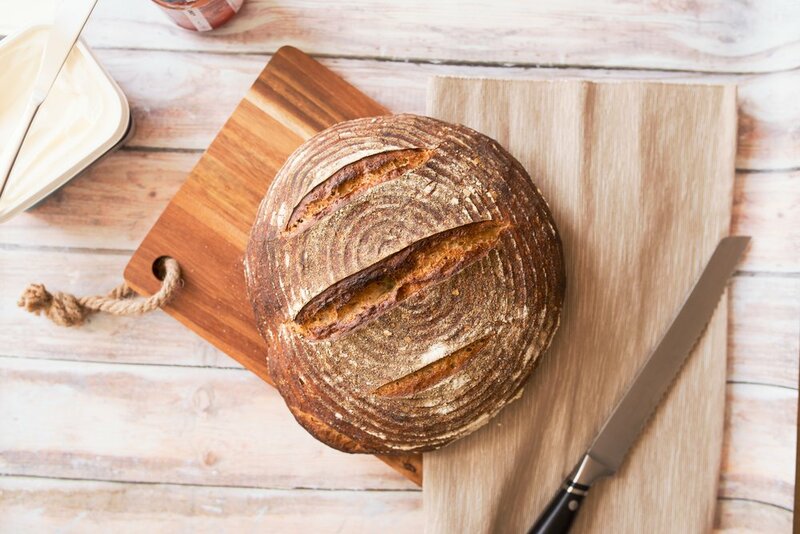 Our baker's process involves a double fermentation which not only gives our breads a mature and wholesome taste, but breaks down the carbohydrates on the dough producing a lighter and more digestible bread. Have our breads as sandwiches along with your coffee or buy a loaf or two for home. You can also order multiple bakery items in advance to be picked up - perfect for your dinner party, work functions or weekly bread. We are a part of Victoria Yards, a community-based urban complex in Lorentzville. You will find us here amongst many other creatives. The focus of Victoria Yards is to provide a space for artisan studios, urban farming, skills development and visual arts. This is a place where crafts people can create, work and exhibit their ideas and where skills and knowledge are shared to empower individuals in the community. We truly believe that providing people with the opportunity to showcase their talent or to develop new skills is important in creating an environment where people thrive as a community. Be sure to follow us as we put together ways to share our knowledge and skills of coffee-roasting and bread-baking. Workshops and events will be held in the future where you can learn from the best.